Did you know there are many ways to stay safe on Luas and around Luas? By working together to report incidents of anti social behaviour on board the trams and at the Stops we can reduce the number of incidents occurring. Luas is a safe, frequent, clean and reliable transport service which last year transported over 32.4 million people. Let's all work together to keep it this way. Luas Customer Care Centre Call LoCall number 1850 300 604* and explain your situation to our Customer Care Officers. Luas Staff onboard: Inform Luas staff on-board of an incident*. Security Personnel: Inform Security Personnel on-board immediately of an incident*. 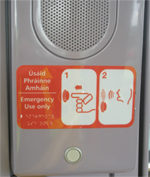 Luas Driver: alert the Luas Driver by pressing the Emergency Help Button on board the tram located by the door. * Luas Customer Care hours are Monday to Friday 7am to 7pm Saturday 10am to 2pm. Office closed on Sunday. * Luas staff and STT Luas security are not present on all trams. Emergency help points are located beside tram doors and at all Luas Stops. How to ask for help on the platform? In case of emergency, you can use the Emergency Help Point present at all Stops beside the Ticket Vending Machine. Your call will be answered by Luas Control Room which has an overview over all the Luas system by a CCTV system. Wait for an answer and then explain the situation to the Luas Control Room. If you need assistance you can also call Luas Customer Care LoCall 1850 300 604*. How to ask for help on board? Emergency Help Buttons onboard all trams will link you directly to the Luas Driver who is also connected to the Luas Control Room. CCTV is working onboard the tram as well. Wait for an answer and then explain your situation to the Driver who is in constant contact with the Luas Control Room. If you need assistance you can also call Luas LoCall 1850 300 604*. 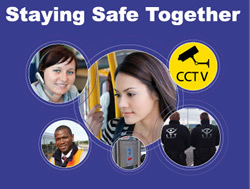 CCTV cameras are present all over the Luas system, at Stops as well as onboard the trams. CCTV downloads can be requested by Gardai. Please note a request must be made immediately particularly if it relates to an incident. The type of information which is required is Stop name, time, tram number if possible and date. Luas Customer Care opening Hours: Monday to Friday from 7am to 7pm ; Saturday from 10am to 2pm. There is an answer machine service for out of hours and a contact us section on Luas website. We encourage people to use these in out of hours times.